To date, there are no international institutions that are in a position to resolve debt crises in a fair, orderly and sustainable manner. This is a problem that has been identified at numerous UN Summits and high-level meetings, but has never really been resolved by the international community. Expectations were therefore high when, in late 2014, the UN General Assembly finally adopted a landmark resolution and set up a committee to develop a multilateral legal framework for sovereign debt restructurings, essentially the long-awaited insolvency regime for countries in debt crisis. A key reason why debt crises are so frequent, have such a devastating impact for the economy and the people living in the affected countries, and take such a long time to resolve is that there is no insolvency regime in place. When a private firm goes bankrupt, there are clear insolvency procedures. There are insolvency courts that make binding and enforceable decisions, and there are insolvency laws to guide such decision-making. No similar regime exists for insolvencies of a state, for sovereign insolvencies. The first meaningful attempt to address this problem was made by the International Monetary Fund (IMF) back in 2002, when the debt crisis in Argentina motivated the IMF staff to propose the creation of a Sovereign Debt Restructuring Mechanism (SDRM). However, this proposal was criticised by many, including by civil society organisations (CSOs). A key deficit of the SDRM-proposal from our perspective was that decisions would be made by an IMF-appointed panel and would be based on IMF analysis. However, CSOs argued that the IMF – as a creditor institution – is an interested party, and should not be the judge at the same time. Civil society also argued that decisions on debt restructuring should take into account that countries need to prioritise financing development and human rights – the latter being dependent on public service provision – to their citizens over debt service. Such decisions could not be expected from the IMF, whose track record is to be very creditor-friendly and turn a blind eye to human rights issues when imposing conditions on crisis countries. In any case, the SDRM proposal was quickly shelved due to the resistance of a few countries on the IMF Board – in particular by the US, which can stop any IMF initiative due to the de facto veto right they have on the Board. Not much has happened in the intervening years due to a fundamental problem: International reform processes require a champion, a government that is willing to take the initiative and then press to take things forward. But countries that are not in debt crisis are usually not very interested in building better institutions for crisis management, while those that are in debt crisis and need such institutions urgently stand with their back to the wall and have no political power. In 2014, however, the consequences of a single court ruling at a New York district court changed the picture. After the Argentine debt crisis of 2002, Argentina proposed a debt restructuring to its creditors to reduce its debt burden. More than 90% of the creditors accepted the offer. But a group of holdouts sold their bonds to vulture funds. These vulture funds that had bought the Argentine bonds cheaply, at a fraction of their nominal value, sued Argentina for full payment, aiming to make a profit of 1,600% on their investment. 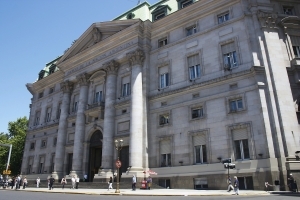 The US court ruled in favour of the vultures and, even worse, to enforce that ruling, it judged that Argentina can no longer pay its other cooperative creditors unless it pays the vultures too. But Argentina stayed strong and chose to default on all its debt payments instead of paying the vultures. This court ruling made clear to everyone how dysfunctional a (non-)regime is – a regime that cannot ensure the participation of all creditors in unavoidable debt restructurings, and that gives vulture funds the possibility of making huge profits at the cost of a crisis countries’ population, and at the cost of cooperative creditors who shoulder the burden of debt relief. Needless to say the ruling outraged Argentina. Argentina managed to mobilise first its close allies in Latin America to campaign for reform processes, and eventually the whole G77, the developing country group at the UN that represents 134 of the 193 UN Member States. It probably helped that the G77 was chaired by Bolivia in 2014/15. A regime-building process at the UN was the only viable option, because it was clear that a new IMF attempt would not even survive the first Board meeting without being killed by a US veto. New York is an important financial centre for issuing and trading government bonds, and vulture funds are important donors for US politicians and parties in Washington. 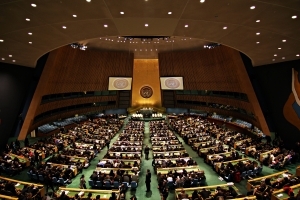 In August 2014, the UN General Assembly adopted by vote the landmark Resolution 68/304, entitled “Towards the establishment of a multilateral legal framework for sovereign debt restructuring processes”. The adoption was secured by the G77 majority in the UN General Assembly; the majority of European nations including Norway abstained; 11 countries voted against, among those the most important financial centres and creditor nations such as the US, Japan, Germany and the United Kingdom. A second ‘Modalities’ Resolution adopted soon after set up an Ad Hoc Committee at UN General Assembly level to lead the negotiations. Starting from February 2015, the Committee held three negotiating sessions. In addition there was one expert workshop co-organised by the UN and Joseph Stiglitz’s team, held at Columbia University in New York in April. The Committee’s work was also informed by the previous work of the UN Conference on Trade and Development (UNCTAD)’s expert group on debt workout mechanisms – a project made possible by a Norwegian grant to the UNCTAD, which has not been renewed. The expert group released the UNCTAD Roadmap and Guide for Sovereign Debt Workouts in April, just in time for the negotiations at the UN General Assembly. A key challenge for the Committee’s work was that the sessions were boycotted by essentially all nations of the Global North, including the whole EU, which mainly responded to the UK’s desire to stay away. Norway did send a delegate to the Committee, who was silent throughout the whole process. In consequence, there were many empty chairs in the UN’s Trusteeship Council where the sessions took place. European CSOs did participate. A key advantage of a UN process as compared to other platforms where sovereign debt issues are discussed – namely the IMF and the Paris Club – is that it is inclusive and transparent. While the IMF and the Paris Club negotiate behind closed doors and do not even publish the minutes of their meetings, the UN Committee involved multi-stakeholder participation, and all sessions were broadcast live on UN Web TV for the whole world to watch. This was a process innovation in its own right. For the first time ever, a regime-building process on debt took place in a fully inclusive, transparent and accountable forum. As well as participating in the Committee’s debates, we formally submitted a joint CSO position to the Committee in which we outlined our vision for a new debt restructuring regime, stressing in particular the need to link debt workouts with development needs and human rights. As European CSOs, we also responded to our governments’ boycott by sending letters to all European embassies in New York and finance ministries in European capitals, calling on them to engage. Needless to say, we were outraged by their boycott. The political agreement to create better debt workout organisations comes from the outcomes of the UN’s financing for development (FfD) summits, which have been endorsed by all European nations. The EU boycott sent a very bad signal to Southern partners ahead of the Addis Ababa summit in July, making clear to them that actual implementation of FfD agreements is not really intended when financial industry interests are at stake. Moreover, for us Europeans it was incomprehensible that – in the midst of an unresolved Euro crisis that drove millions of European citizens into poverty and unemployment – our governments refused to take any action. We garnered support from the European Parliament in May when they published their resolution on financing for development: paragraph 46 stated that the Parliament “insists that sustainable debt solutions, including standards for responsible lending and borrowing, must be facilitated through a multilateral legal framework for sovereign debt restructuring processes, with a view to alleviating the debt burden and avoiding unsustainable debt; asks the EU to engage constructively in the UN negotiations on this framework; urges the EU to push for the implementation of the UNCTAD principles of responsible sovereign debt transactions for both borrowers and lenders”. However, in what can be regarded as an affront to the European Parliament, EU governments simply ignored this resolution. There were constructive forces in the European governments, but these have been marginalised by a not so constructive coalition led by the UK and Germany. Southern EU Member States were generally more open to EU participation. Greece was the first EU country that started to send a delegate to the Committee’s session. Ireland and the Czech Republic, two of the eleven countries that had voted ‘no’ on the 2014 Resolution, changed to ‘abstain’ in later votes. Also within countries, there have been disputes between different ministries. Foreign ministries have generally been more open to the UN process, while finance ministries were more reluctant. The reason was simply that, in most European nations, the responsibility for UN processes lies with the foreign ministry, while finance ministries are in charge of IMF processes. Finance ministries insisted that ‘sovereign debt’ was an IMF issue. They feared losing control when regime-building moves to the UN. Generally, the European view was that the IMF was the place to discuss such issues – despite all the evidence that the IMF is the place where sovereign debt restructuring frameworks go to die. Due to the boycott, the G77 lowered their ambitions. In an attempt to make it possible for all actors to come in and get a General Assembly resolution adopted by unanimous consensus, they made the concession to adopt “Basic Principles on Sovereign Debt Restructuring Processes” instead of the ‘Multilateral Legal Framework’ that was originally supposed to be developed – and that would be urgently needed to overcome the unjust and dysfunctional non-regime for the management of debt crises that we have now. However, the destructive forces did not reward these concessions. When the Principles Resolution was finally voted, it could not be adopted by consensus. The G77 and some others voted in favour; most European nations, including Norway, abstained. Six countries voted no, including Germany and the UK, which even violated a European Council (ECOFIN) decision by doing so. At the end of the day, the UN agreed to adopt a set of nine Principles. They start with ‘sovereign immunity’ and the ‘right to restructure’, which each nation in debt crisis has the right to restructure its debts, a necessary action “which should not be frustrated or impeded by any abusive measures”. This is, of course, mainly to address the problems with holdout creditors and vulture funds. They also include process-related Principles such as ‘Impartiality’ and ‘Transparency’, which address the problem that currently debt restructurings are negotiated behind closed doors and decisions are made by creditor institutions such as the IMF or the Paris Club. As such, the Principles are obviously a pretty good innovation, and the first official UN framework in this area. The main problem is that these Principles are not really binding, and compliance with the Principles by creditors and debtors is not enforceable. This would have been the main advantage of a real legal framework. We cannot know yet what the impact of the Principles will be, and if they change the way future debt crises are resolved. More work will be needed to make this happen. For example, through a follow up-process at the UN that strengthens the Principles and makes them more binding. The Principles Resolution already foresees that there will be a follow-up process at the UN. But also through putting pressure on debtors and governments to comply with such principles in future debt restructurings. The Principles are a first step, many more are necessary to build the regime we need.